COULD PEOPLE FLY FROM LONDON TO NEW YORK IN AN HOUR? (P1) Airbus has won a PATENT for a hypersonic passenger plane which could potentially fly from London to New York in an hour. (P2) DUBBED Concord 2.0, the jet would be capable of flying more than four times the SPEED OF SOUND. (P3) Documents filed with the US Patent Office refer to an “ULTRA-rapid air vehicle and related method for aerial LOCOMOTION“. (P4) So are we on the VERGE of a revolution in air transport? (P5) How does it work? (P6) According to the documents, the jet would reach speeds as high as Mach 4.5, or four-and-a-half times the speed of sound. That compares to Mach 2 for Concorde. (P7) The patent application says that the aeroplane would use a variety of engines that would serve different purposes and power would come from hydrogen stored ONBOARD. (P8) Two turbojets under the FUSELAGE and a rocket motor in the rear would be used during take-off. It would lift off vertically like a Space Shuttle. (P9) Once launched, the turbojets would be shut down and RETRACTED and the rocket motor would then KICK IN to climb to an altitude of more than 100,000 feet. (P10) Then ramjets, more usually used on missiles, would be IGNITED and the flight would reach a top speed of Mach 4.5. (P11) What would that feel like for passengers? (P12) PatentYogi, a website dedicated to explaining patent ideas, said the flight path of the jet would make it the “highest ROLLER COASTER ride in the world”. (P13) The jet would come with HAMMOCK-like seats for passengers to sit in – necessary if they wanted to travel in comfort. (P14) Travellers wouldn’t have to share the cabin with hundreds of others – the patent application describes it as more of a private jet carrying just 20 passengers at a time. (P15) The idea would also not be limited to commercial flights. In the patent, Airbus also lists military applications for the jet. (P16) Would it succeed where Concorde failed? (P17) The ICONIC Concorde was taken out of service in 2003 because of high operating costs. (P18) In the 1970s, the supersonic jet faced complaints about the SONIC BOOMS and noise pollution created by its four turbojet engines. (P19) As a result it was BANNED from operating over land and was never able to become financially VIABLE, operating instead as a high-altitude transatlantic taxi service for the super-rich. (P20) The patent application for the new jet does address the issue of sonic booms. By climbing almost vertically the new design’s sonic boom would be DISSIPATED in all directions and not reach the ground. (P21) When can I book my flight? (P22) Don’t get too excited yet. (P23) A VAST number of patent applications don’t ever SEE THE LIGHT OF DAY as real products. (P24) Airbus itself was certainly PLAYING DOWN the patents, saying in a statement that the designs were based on “concepts and ideas in a very NASCENT stage of conceptualisation”. (P25) In fact the idea was first published in 2011 and has only now started being publicised because it has won approval from the US Patent Office. (P26) Back then Airbus, then known as the European Aeronautic Defence and Space Company (EADS), said it would take 30 to 40 years to enter service, if at all. (P27) Airbus did say that it is working on two hypersonic projects, one with Japanese partners and another with Russian and Australian involvement, with the aim of CONQUERING speeds up to Mach 6. 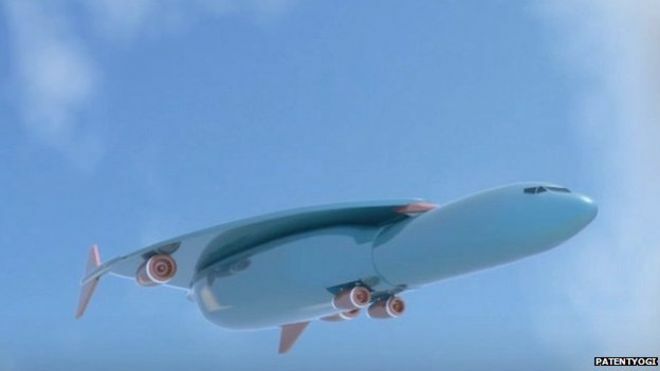 The proposed vehicle sounds more like a space rocket than a CONVENTIONAL airplane. Would you want to fly in it? The article compares this style of flight to a roller coaster. Do you enjoy roller coasters and other AMUSEMENT PARK rides? The Concorde failed because there were simply not enough wealthy people in the world who could afford to fly on it. Do you think this new plane will succeed? Many people complain that modern airplane travel is less comfortable than it was 50 years ago. What would you change about air travel?